Make literacy a significant part of Black History Month! Join us at SLCC's African American Read-In on February 13, 2019 in the Taylorsville Redwood Academic & Administration Building (AAB) Cultural Commons from 12:00 noon until 2:00 pm. 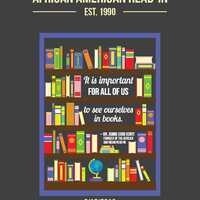 The National African American Read-In is the nation's first and oldest event dedicated to diversity in literature.It was established in 1990 by the Black Caucus of the National Council of Teachers of English to make literacy a significant part of Black History Month.This initiative has reached more than 5.5 million participants around the world.